Microparticles are circulating membrane vesicles that bud off activated or apoptotic cells. They have recently been shown to contain small regulatory RNA molecules (e.g. Microparticles are highly procoagulant due to large amounts of surface-exposed negatively charged phospholipids and presence of tissue factor, the principal initiator of blood clotting. 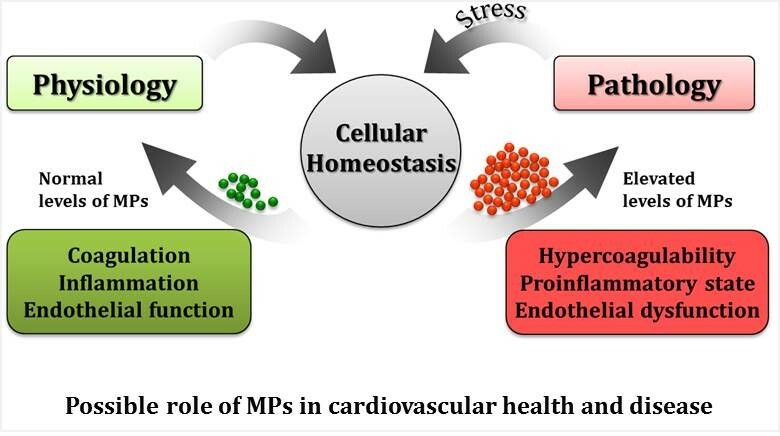 Normal levels of microparticles contribute to ensure homeostasis, but under abnormal conditions cells release high levels of microparticles that differ in composition and function, thereby contributing to a procoagulant and proinflammatory milieu in blood (Figure 1). Tissue factor associated with microparticles in the circulation may play a key role in pathogenesis of venous thromboembolism. However, no study has systematically explored the associations between microparticles or circulating miRNAs and venous thromboembolism. Circulating miRNAs have been explored as biomarkers for arterial cardiovascular- and malignant diseases, used for monitoring of therapeutic efforts in malignant disorders, and targeted in experimental miRNA-based anti-cancer therapies. We have established nanotechnology to measure the concentration, size distribution (detection range 40 - 3000 nm) and surface protein expression of microparticles. By combining this technology with miRNA expression assays, we will be able to comprehensively characterize the cellular origin, concentration and composition of microparticles along with their specific miRNA content in individuals with and without venous thromboembolism. This knowledge will subsequently be tested in cellular systems and animal models. This work will provide novel insight of the role of microparticles and miRNA in the pathogenesis of venous thromboembolism with potential profound impact on preventive and treatment strategies.